Larry Thompson, associate dean for the Division of Art and Design in Samford University’s School of the Arts, recently found his mission, and it began with a need for socks. His revelation came after several conversations and a request from a Samford colleague to help promote the collection of socks for her son serving in the military. In the meantime, Space One Eleven had set about to provide a grant to Thompson from the Andy Warhol Foundation for the Visual Arts to help fund the project. Additionally, the Texas native had read in one of his hometown newspapers about Sgt. Ron Kelsey, a retired soldier and founder of Reflections of Generosity, an exhibit that explores the “spiritual resiliency of our military” and helps to heal veterans through art. All the pieces started to fall into place as Thompson’s exhibit was developing, and his relationship with Kelsey provided the opportunity for Kelsey’s exhibit to come to Samford’s campus during the 9/11 anniversary. The event included a panel on art therapy and the healing power of art. Thompson’s exhibit at Space One Eleven took place in spring 2016 and included several pieces from the Reflections program. The installations of the Infanttree Project are a combination of artwork that addresses Thompson’s conflicts. The “infanttrees” are crepe myrtle branches covered in king cake babies. 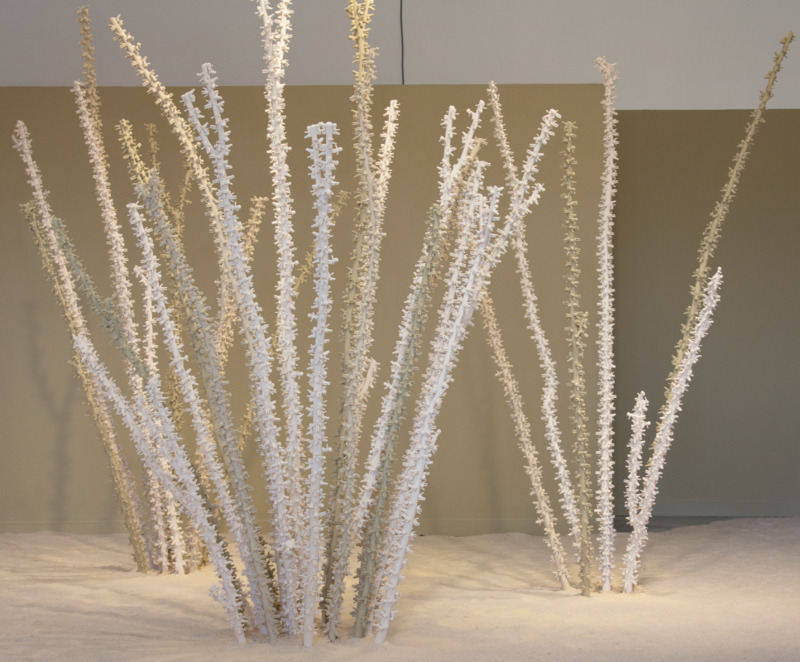 The branches were meant to resemble the Ocotillo cactuses of the desert and to represent the areas where recent wars had taken place. The babies highlight the fragility of life in war and the loss of innocence. His presidential rug created with tiny toy soldiers is a metaphor for a government and country treading on the troops that serve and protect the country. The exhibit also included more traditional works from Thompson with three paintings that share images and text, and a series of postcards. The postcards are photographs with messages treated with motor oil to give them a sepia tone. The motor oil represents the “life blood” of the U.S. and how so many wars are the result of fighting over resources. The postcards share voices from strangers and friends. Suzy Metts, assistant to the dean of the School of the Arts, connected Thompson with her mother, who included her own reflections on war. The event in Birmingham was the catalyst for what happened next. Ron Kelsey contacted Thompson to invite him to be part of his traveling exhibit at the Pentagon in the fall. The Pentagon event coincided with Suicide Prevention Week and combined works from a variety of artists. Thompson was able to take several of his postcards and paintings. While in Washington for the two-week exhibit, he participated in gallery talks and met many of the visitors. According to Thompson, this was the most rewarding aspect of his time in Washington. He said that one Air Force member came every day with a new guest to see the exhibit. Near the closing of the event, Thompson met former U.S. Marine Eric Hughes, who had connected emotionally with Thompson’s piece that incorporated the boots of a soldier. Hughes had lost 27 members of his unit in Fallujah, Iraq, and the layered effect and multiple meanings of the painting with its reference to the number of soldiers killed since Memorial Day struck a powerful chord that has created a bond between the veteran and the artist. Thompson states that this experience and Hughes have become a fresh source of inspiration as the project continues to develop. Thompson’s art has now taken a new path with greater meaning, and he hopes to continue to share this exhibit as well as explore other ways to be more collaborative with his calling. Ashley Smith is marketing and communications coordinator for Samford Arts.